The third leg of four from Chicago to Singapore found me on Asiana flight 104 from Icheon to Narita. After the disappointments from New York to Seoul, my expectations for this flight were significantly lowered. I wasn't surprised. There is always some good so let's get it out. On certain flights Asiana flies aircraft with first class cabins, but doesn't sell first class tickets. That means business class tickets sit in first class seats. My flight on a 747 Combi (a Combi is when half the aircraft is for used for cargo) was one such flight. However they fly the A380 to Bangkok where you can grab a suite for business class and there are flights to London when a 3 class 777 is substituted for the regular 2 class aircraft. The service is business but the seat is first. Another minor plus. When flying in the states I've always wondered why (at least on United) starting with 9:30am departures, lunch is served instead of breakfast. 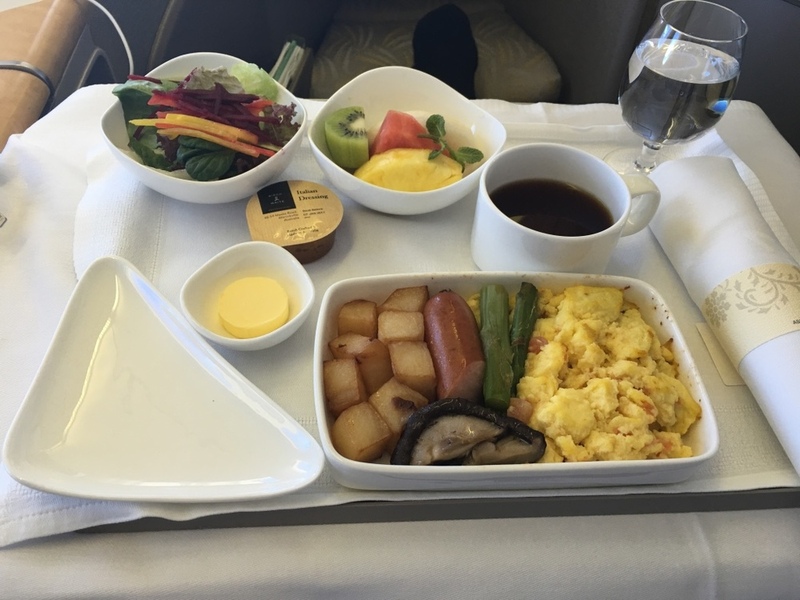 Don't they know to make a 9:30 flight you probably have to skip breakfast? Anyway, this flight left at 10am and they offered a choice of lunch or breakfast. While the breakfast was terrible, at least I had a choice. The seat design reminded me of a business class product with a footwell, only slightly larger. It's a comfortable lie flat seat but past its prime in terms of first class offerings. The tray was very difficult to pull out, and when it was out, you couldn't move the seat to get closer to the tray. There was at least 8 inches between my chest and the tray table. More napkins please. The IFE monitor was ancient and you couldn't see it with the window shades up. It was definitely analog and probably about 12 inches in diameter. And at 4 feet away, with no way to get closer, I didn't even bother to watch anything. You also had the option to play something from your iPad or iPhone and watch it on the monitor. 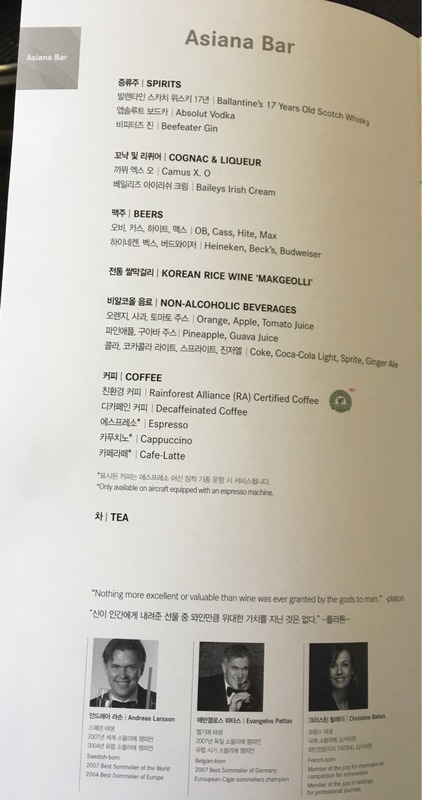 Asiana has great reward availability on all it’s flights both to Korean from North American and within Asia for connections to other cities. For me this flight was part of a ticket from Chicago to Singapore. However on it’s own would require 30,000 miles for business class. The fare is $472.00. That equates to 1.6 cents point valuation, something I would never do. As part of a connection it’s fine as my point valuation for the trip was 8 cents per mile. Ticketing on United’s website, easy and without issue. Seating different story. Read OZ JFK-ICN for that disaster. The airport in Icheon is new and nice. Departures are from level 3 and once inside security you can go to level 4 which has a transit hotel, shower and rest areas for anyone to use and access to most lounges including Asiana First Class lounge. The lounge for Asiana Business Class is just outside security by gate 28 on level 3. Take the escalator up. It’s a fairly good size lounge with a reasonable selection of food. I was there at breakfast and they even has a station cooking fresh fried eggs. In addition, they have massage chairs in a private rooms, showers and rest areas. The cabin is long past its time. While no one should complain about sitting in a first class seat for a business class ticket, it would be irresponsible to not point out the exposed insulation between the cabin wall and seat. Hence the “What were they thinking?” check mark. It’s difficult to be uncomfortable in a first class seat on only a 2 hour flight. The seat had the bells and whistles. Oh, they didn’t. There was however a set of slippers you could keep. The breakfast was not edible, in my opinion. And I typically have a salad with my eggs, don't you? All flight attendants were accommodating and pleasant. This is one of four remaining Asiana passenger 747-400 aircraft. They also have a number of cargo 747s. My aircraft was delivered to Asiana in August 1996. Happy 20th birthday. What to do?I came within a mouse click of changing the flight. Am I glad I didn't. After the disappointments from New York to Seoul, my expectations for this flight were significantly lowered. I wasn't surprised. Do you have any Asiana experiences you'd like to share? Feel free to leave a comment.